up arms in a harem of horses. bagged and ready to go. thin mystery within my skin. Quinn Rennerfeldt earned her degree at the University of Colorado at Boulder and currently lives in Denver with her daughter, husband, and ornery cat. She currently serves as a poetry co-editor for Blood Lotus. She was most recently published in Wazee Journal and has work forthcoming in Slipstream in 2014. Joe Wahlman was raised in Michigan’s Upper Penninsula, where he now lives with his wife and son. He has taught English for fourteen years in both Colorado and Michigan. ’The Waiting Room’ is a part of the poetry collection ‘Hasting Notes in No Particular Order’ from Aldrich Press. The poem is previously published in Best Poem. only flexing fingers resisting to curl into meaty fists. our faces are blank, worn smooth from constant battle. maps of earlier skirmishes crisscross our souls. Will we burn each other to ashes? Carolyn D. Elias is a writer, currently living in Morris, MN with her husband and two cats. She writes poetry and short stories. Carolyn also works as a freelance editor. This is her first publication with Sassafras Magazine. Carol Tyx teaches writing and American literature at Mt. Mercy University in Cedar Rapids, Iowa. Her work has most recently been published in RHINO, Poetry East, Water-Stone Review, Iowa City’s Poetry in Public, and Rising to the Rim, published by Brick Road Poetry Press. On any given day you might find her cooking with kale, contra dancing, or standing on her head. my daily dealings like scrambled eggs. confronting the homeowner like the past. blond locks shining in the birth of rays, deceptively. Amanda Tumminaro lives in Illinois with her family. She enjoys reading, writing and caffeinated drinks. She has been published in Black Book Press, Storm Cellar and Shemom and her work can also be found in a forthcoming issue of The Stray Branch. Foliage and cleavage sail like confetti onto our voyage. Which features are your own. So age has brought lace from the sea onto your face. These infrared trees, lay darkness sublime as stirred melodies. THERE WERE ETERNITIES DURING WHICH IT DID NOT EXIST. is the very absence of nature. THE THOUGHT DID NOT BRING YOU CLOSER. ’Two Poems’ were first published in Chax, issue 4. These poems are appearing in Sassafras after a request from the editor. Lynn Xu was born in Shanghai. Her poems have appeared in 6×6, 1913, Best American Poetry 2008, Boston Review, Octopus, Poor Claudia, and others. A chapbook, June, was published by Corollary Press in 2006. The recipient of a Fulbright Fellowship and a William L. Magistretti Fellowship, she is currently the Jacob K. Javits Fellow at UC Berkeley, where she is a Ph.D. candidate in Comparative Literature. She holds an MFA from Brown University. With Robyn Schiff, Nick Twemlow, and husband Joshua Edwards, she coedits Canarium Books. Between Stuttgart and Marfa, she divides her time. Her debut collection Debts and Lessons was published in 2013 by Omnidawn Publishing. & I had blown it. it would all just disappear. into the pines by the gathering crows. something soft & warm & beyond me. And I would be glad for it. a mist from the river’s empty rooms. Thumb of autumn, thumb of locust, thumb of every kissed lip. what the cow got from this? & the carcasses swimming the eaves. cut off another finger in the shredder. Son, at least you still got your arm. a blanket of white petals from the tree of moon. the cow’s one open eye. lay down with it: calf soft: morning breath. 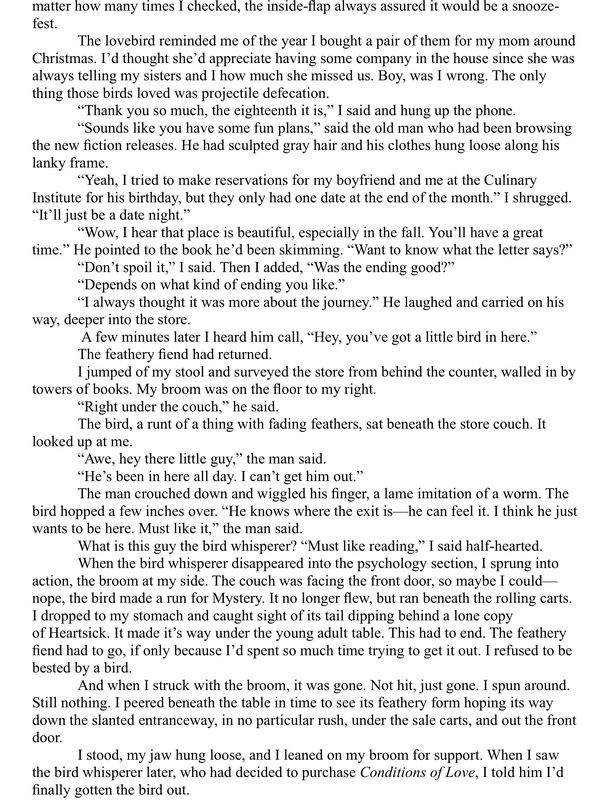 ’Hitchhiking in the Dying South’ was first published in Blackbird, 2003, Vol. 2. No 1. The poem is appearing is Sassafras after a request from the editor. Joshua Poteat has published two books of poems, Ornithologies (Anhinga Poetry Prize, 2006), and Illustrating the Machine that Makes the World (VQR/University of Georgia Press, 2009), as well as two chapbooks, Meditations (Poetry Society of America, 2004) and For the Animal (Diagram/New Michigan Press, 2013). A chapbook, The Scenery of Farewell (and Hello Again), is forthcoming from Diode Editions, 2014. Roger Bernard Smith is a 75 year old poet whose poems have appeared in a dozen journals. His first chapbook is being published in February 2014 by Tiger’s Eye Press, Denver CO. He teaches writing in the Mohawk Valley Institute For Learning in Retirement (MVILR) at SUNYIT, Utica, NY. He lives in the foothills of the Adirondack Mountains. To view for us like notes in the margin. Fluorescents also rise, late. Set early. Kevin Murphy’s work has appeared in Heron Tree and Gravel Magazine. He received his MFA in Creative Writing from the University of Idaho and currently resides in Asheville, NC with his person named Shannon. make a sign in the air as if death matters. even with the window open. Simon Perchik is an attorney whose poems have appeared in Partisan Review, The Nation, Poetry, The New Yorker, and elsewhere. His most recent collection is Almost Rain, published by River Otter Press (2013). For more information, including free e-books, his essay titled “Magic, Illusion and Other Realities” please visit his website at www.simonperchik.com. The chicken nuggets may burn your fingers. May cause ghost vanilla soft serve and hot fudge to scald and freeze your tongue. Possible side effects include sticky-slick crayon sketches on paper tablecloths and your mother, smiling, her hand on her soap-bubble belly. Inside, she says, is a new sister, a wrapped gift with a name tag but no encyclopedia entry. If effects continue, ride into the summer in a cloud of Old Spice and car exhaust. 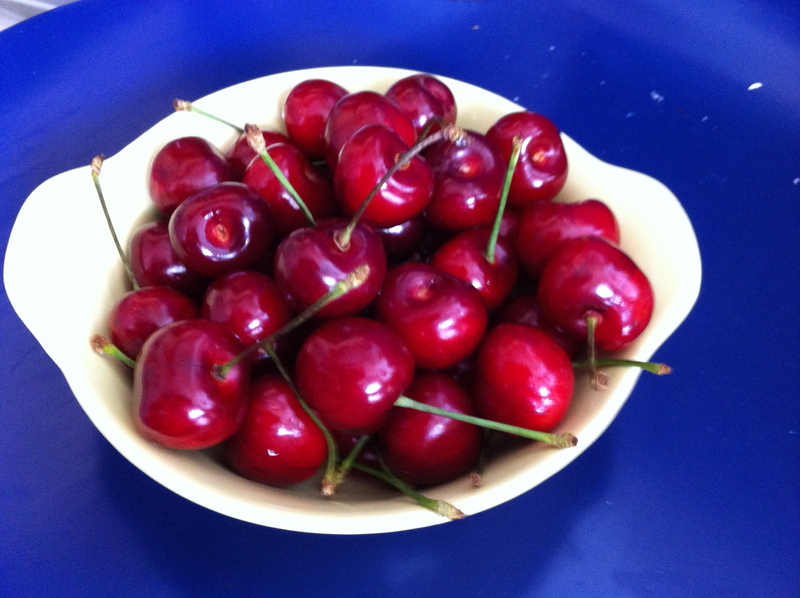 cherry pie in my hands. or strawberry with pineapple chunks. until I bang my elbow on the corner of the oven. Allison Hymas is a recent graduate of Brigham Young University with a Masters of Fine Arts in Creative Writing. Her work has been published in FLARE: The Flagler Review. You drop the last shove-full of earth. You pat the pile, this small grave, trying to even it with the rest of the yard. It won’t look even for a few days, maybe a week, but the grass will grow back. You thrust the blade beside the grave, the yard soften by the steady rain. The drops land on your shoulders and head as you rest your chin on the shovel’s handle. You cough and blame it on the rain. Your wife and daughter stand around the pet grave, looking down in silence. Your wife holds a black umbrella, chosen over the blue with regards to the situation. Your daughter looks like a toy inside her yellow, plastic raincoat. Your wife looks to you, nods, and you nod back. It was her idea, supposed to help the child through the grieving process. “Would you like to say a few words?” She puts a motherly hand on your daughter’s shoulder. Bending with her knees, she remains dry. It was you who found the frog dead in its dry aquarium. Snot, the croaking lump of green, had become a lifeless lump of green. You coughed into your hand before handling the frog. When you showed it to your wife she told you how important funerals can be to children, that it gives them practice. You just shrugged. When your daughter came bouncing home from school, dripping from the weather, you went to find the shovel. It was your wife who explained the circumstances. She was always better with the emotional kind of stuff. “It was beautiful, honey,” your wife says, still ready to hold your daughter in a tight embrace. It could have been the rain, but you thought you saw tears. The two discuss something then hold hands. Your wife walks back to the house while your daughter, the daughter to both of you, skips. You pat the mound with the shovel again. She was right. It turned out to be good practice. You cough, harder this time. Dry breath hits your knuckles. Inside, a light comes on. Your wife and daughter appear as silhouettes, retrieving bowls, spoons, and the ice cream from the freezer. Instead of putting the shovel back in the garage, you lean it against the outside. They’re small and will need a doctor to find, but you already feel the out-of-control cells conquering the pink lumps that are your lungs. Bennett Durkan is a graduate of Stephen F. Austin, where he earned a master’s in English. His poetry has appeared in Psaltery & Lyre, The Red River Review, FIVE2ONE Magazine. 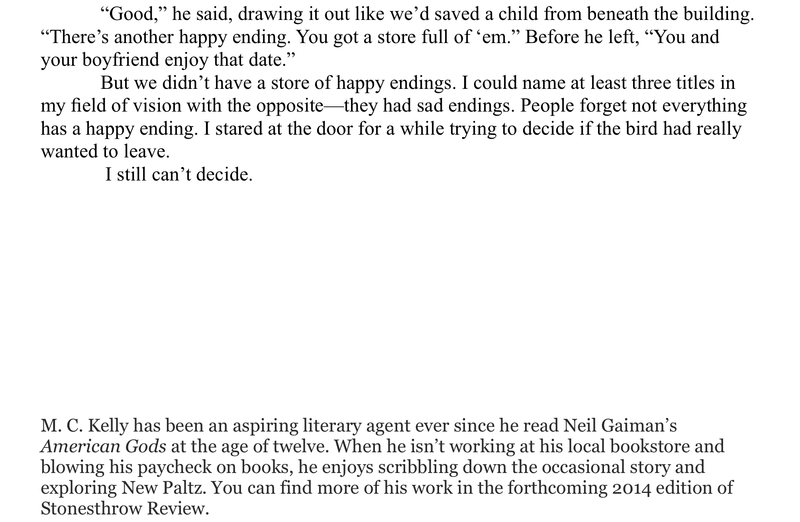 He also won The Piney Dark fiction contest for 2013. Carol Smallwood’s over four dozen books include Women on Poetry: Writing, Revising, Publishing and Teaching on Poets & Writers Magazine list of Best Books for Writers. Carol has founded, supports humane societies. The ventilator huffed in my ear, as it pushed oxygen into her lungs, clicking at the end of each breath cycle. A monitor, with tentacles stretched onto her limp torso and fingertip, would display her vital signs in different colors, beeping to her heartbeat. I sobbed while searching the literature for new treatments: surgical, medical, holistic, anything. Had we baboons made any scientific progress in the past five years? Screw the poor prognosis. Blast it’s-the-worst-kind-of-hemorrhage. I wanted to fight death on her behalf; fly to where she was hospitalized and sit by her ICU bed, not as a physician but as a woman; read to her; play her children’s recorded voices; have harp music at the bedside, because in one study it helped stabilize patients’ blood pressures. I would do what the doctors didn’t have time to, recruit her mother to read her favorite book, ask her father to tell her stories of childhood Christmases. No one was allowed to walk away from Anna or assume she wouldn’t make it, not even the soon-to-be-ex-husband. I needed her to fight, for her life, for the sound of her children’s voices, for her youth, to prove she can, and because he had resigned. I didn’t know her, yet wanted to be there because no woman should face death or disease alone. What makes me wage the war of the century for her sake, convinced I’m the only one in her corner? Is it that I have experienced divorce too? Or, that the woman I want so desperately to devote my senses to, the one I’m defending with all my might, the one I wish others wouldn’t give up on, is me inside Anna’s body? Bahar is an Iranian-American woman who immigrated to the United States at the age of seventeen, having lived through the revolution and Iran/Iraq war. Once a non-stop talker, she had to remain silent for a year before being able to communicate effectively in English. She left a career in oral and maxillofacial surgery to become a writer. Her works have been published in a number of literary journals including: Mslexia, the Newer York, Mandala Journal, Monkey Bicycle, and Marco Polo Arts Magazine, where she is a regular contributor. Her non-fiction essay is forthcoming in the anthology In The Night Count the Stars. I find Mom sitting in the dim kitchen nearly naked, wearing only a see-through nightgown and a pair of holey underwear on top of her head to protect her curlers. Her eyes droop. She hasn’t slept. “What?” I ask, frightened, my backpack still in hand. Back and forth her head slowly shakes. “What?” I ask again. Evelyn isn’t bad so much as she’s rich and white, and judgmental. She wants to help, to check on us, make sure we’re still alive inside our rat’s nest. So every year, she gets off of her husband’s yacht in Miami and flies to Oakland where her brother, his black wife, and all of their millions of children (five) continue (to her amazement) year after year, to exist. How were we not dead yet? How had we not been killed by one of Dad’s booby traps? How had we not been killed by a bullet on the murderous Oakland streets? And those public schools. So many things could have and should have killed us. That’s what Mom would have us believe about our aunt, and so even though she was nice enough, bought us things, bought things for the house, I remained skeptical. I watched for her judgments. But often, they never came. “Next week.” Mom pretends to weep in her hands. “Just look at this…” She lifts her hands from her face and motions to display the state of the house. She describes the state of the house in shapes. It’s in good shape or it’s in bad shape. After relatives visit, when we clean the best we can, make things “passable,” as Mom says, meaning there are chairs to sit on, and more than just a narrow pathway to squeeze our bodies through each room. Bad shape is when we haven’t had visitors for a while, when we forget our furniture is made of wood because we can’t see it. Every surface is covered in papers, seeds, tools. The house is in bad shape. I put myself in the shoes of my aunt who will arrive in a week. She will notice a chainsaw near the front door, an industrial-sized ladder resting on the couch. She’ll see a coffee table covered in mail and plants. Horrified, I continue scanning the house as far as I can see. Evelyn would have to take large steps over boxes used for organizing with labels on them in Dad’s handwriting: BILLS, TAXES, MAIL they said. She would then enter the dining room where she would see more papers, surrounded by boxes stuffed not with what their labels would have you believe, but full of more fun finds like pine cones, naked headless barbies, photo copies of very important articles that Dad cut out from the Oakland Tribune, and old issues of Outdoor Alabama magazine. The six chairs around the dining table were also covered. They were storage for phone books, all seven of them, electronics Dad wasn’t ready to part with—a broken walk man, a retired boom box, walkie talkies with wires hanging out of them like guts, lots of dead batteries. I join Mom in her anxiety, knowing that when Aunt Evelyn walked on, into the kitchen, she would find a room from which no perspective or angle could you see a sliver of counter or floor space. The surfaces were completely filled: a toaster, four or five half-full loaves of bread, open jars of peanut butter with spoons inside. More peanut butter behind the pile of plates. A pot of rice from the day before. A skillet coated in congealed oil. Cans of soup. Packages of Jell-O. Tapioca pudding. Dirty mugs. Cardboard coffee cups stacked from the nearby coffee shop for reusing. Oily paper bags full of day-old pastries, also from the coffee shop. She’d see our latest acquisition, a small TV sitting on top of a broken swivel chair found on the street that offered five fuzzy channels. In the middle of the kitchen, near boxes and broken appliances, there is a chair for sitting while either talking on the phone or watching TV. This is where Mom sits. Above her is the refrigerator, which we’re proud of; water and ice come out of it. On top of the refrigerator is Dad’s filing system for receipts. Every time anyone opens or closes the refrigerator, a shower of receipts falls on top of their head. Claire. When I open the door I find my beautiful seventeen-year-old sister Claire sitting on the living room floor, her long bohemian skirt a pile around her legs, her lips red, her curls fallen onto her face as she and Mom laugh. I am merely seven. She is my hero, in part because she doesn’t have to live here. “Guess who’s here to pitchfork!” Claire shouts when she sees me. She calls cleaning for relatives pitchforking. It’s a term she made up for the final moments before they arrive when things gets desperate and we stop thinking about logical places for things and just started tossing entire boxes down the basement stairs, under beds, and into closets. A week later Aunt Evelyn arrives. Just hours before her plane touches down, the house is finally becoming passable. Dad paces nervously around the house peering over at what we’re doing, making sure we don’t throw anything valuable away. “What are you doing with that?” He comes running towards me. In my hand is a cracked plastic filing rack that I’m about to toss in my garbage bag. “That’s perfectly good,” he says, taking it from my hands. “But it’s cracked,” I say. “And we have a bunch of others that aren’t.” I point to a pile I had uncovered as I cleaned. He storms out of the room. I hear the front door slam. And five minutes later he returns, eyes on my garbage bag. He waits until the very last moment to leave for the airport to pick up Evelyn. From the front window I watch as his truck pulls off and drives down the street. I run to the kitchen to join Mom and Claire, as they stuff everything in sight into bags and begin tossing them down to the basement. I stuff several bags in the closet of the bedroom all of us kids share and other bags under Mom and Dad’s bed. The phone rings. It’s Dad calling from a payphone. We’re relieved to have a little more time. Mom goes to the Laundromat to wash sheets, towels, and a tablecloth. Claire sweeps and I shove the receipts on top of the refrigerator out of sight. When too much time has passed, I glance out the front window every few minutes. I have watch duty. From the window I see the truck pull into the driveway, her luggage precariously loaded on top of a layer of gardening tools and the chainsaw Dad took out of the house earlier that week in his fury. “They’re here!” I alert everyone to get into position, look normal, wipe the dirt and sweat from their faces. Evelyn opens the truck door. I watch as she looks up and down the street, re-familiarizing herself with the neighborhood. Her red hair is exactly the same color as his. Her nose just as big. Claire says the only difference between them is that Evelyn married well. I think about Mom, I think maybe she didn’t marry well when she married Dad. I hear Claire and Mom scuffling in the back. Vivian has retreated to our bedroom. I wait in my place on the couch to greet Evelyn when she comes through the door. I am the greeter. Someone has to be the buffer between Dad and everyone, so I stay. “Hello my dear,” she sings the word hello and comes towards me with wide-open arms, grinning. Up close, she smells just like chlorine. When she lets go, she looks at my Dad and asks him if she can use the bathroom. “Oh Bruce!” she says, hitting him on the chest. “We only invite guests over who have superior, enlarged bladders.” She laughs to be polite. “I thought we were related, but I guess not. My relatives all have enlarged bladders,” he says. “Let me go ask Shirley if it’s ready,” he says, walking through the dining room he now barely recognizes. All of his things are missing from it. He doesn’t know how to act, where to put his body, and he most definitely does not know what to say. And in his dismay at the state of his house, the absence of his things, he has ruined it all. The whole point is to pretend we haven’t tried to make the house look this way, that there aren’t bags of garbage hidden behind every closed door. He returns with the okay, but explains that the toilet is rigged so if she has to go number two she really can go to the café if she wants to be comfortable. Still, Evelyn opts to use our bathroom. When she comes out, we wait for her to have something to say or do because we have nothing to say or do. We don’t even know where anything is. We barely recognize the surfaces she begins placing her things on: her purse, her sunglasses. Do something, Evelyn. Say something. We have nothing planned besides having a passable house for her to enter. Claire, Mom, and Vivian still won’t come out. Junior still isn’t home. I have Dad duty. I have to be there with him. I can’t leave him alone to do something like offer to hang her sweater in the front closet where I know for a fact a garbage bag is stuffed. I watch in horror every time Dad opens his mouth. Luckily, Dad’s first instinct in uncomfortable situations is to leave them. Dad returns nearly an hour later with a bag full of Chinese food from the restaurant around the corner. We eat at the table for the first time in almost a year. Vivian emerges with the smell of food. She greets Evelyn, makes herself a plate and sits at the silent table with us. Evelyn attempts to fill the silence with questions, which Vivian responds to with one word answers: good, no, yes. With the slam of the door, Evelyn, Vivian and I are left alone. Our chewing fills the room. After minutes that seem hours, Mom appears. She is dressed for Evelyn in a red blouse, jeans, and maroon lipstick. Her head is full of fluffy pressed curls, shiny with oil. Even over the smell of Chinese food, her perfume fills our noses. Claire follows. She wears a loose green knit sweater that slumps off one shoulder, jeans with holes in both knees, her hair an explosion of curls that she has to constantly move out of her face. I am instantly grateful for their presence and furious with them for leaving me alone for so long on Dad duty. I relax into my seat and let them take over. Claire is good at talking to people. I can see the rage growing behind Mom’s squinting eyes and half smile. Her body moves with a rigidity saved just for Dad’s sisters. Evelyn takes my brother Junior and I for a walk through the part of the neighborhood full of shops and cafes. Evelyn walks ahead, waiting and looking back at us from every corner. Her long, freckled boat legs are faster than ours. She walks like she knows the place. “Here,” she says, pointing to a bookstore. We follow her in and then we all separate. I go to the kid’s section and Junior goes to the comic books. She has a stack of books on the counter when we’re ready to check out. She buys Junior and I one book each. On the spine of one of her books I read the words Driven to Distraction, followed by the words Adult ADD. Later that day I notice that Driven to Distraction is sitting out on the dining room table in plain sight. I don’t move it. It stays there all day. I see everyone pass by it, reading its title, picking it up, putting it back down in its place. When Mom sees it, she picks it up, too. “What’s the meaning of this?” Mom holds the book up. When she’s upset, her speech is styled in anger. She repeats herself in a British accent. “What is the meaning of this?” She sets the book back down and looks at me. When I see the book again it’s on the front porch. There is evidence of Dad in it—it’s bursting with receipts and newspaper clippings, an envelope of seeds. Melissa Valentine is a writer and acquisitions editor living in Oakland, CA. She received her MFA in nonfiction from Mills College. In 2013, Melissa was a finalist for Glimmertrain’s Family Matters writing contest. She is currently at work completing her memoir, The Names of All the Flowers. 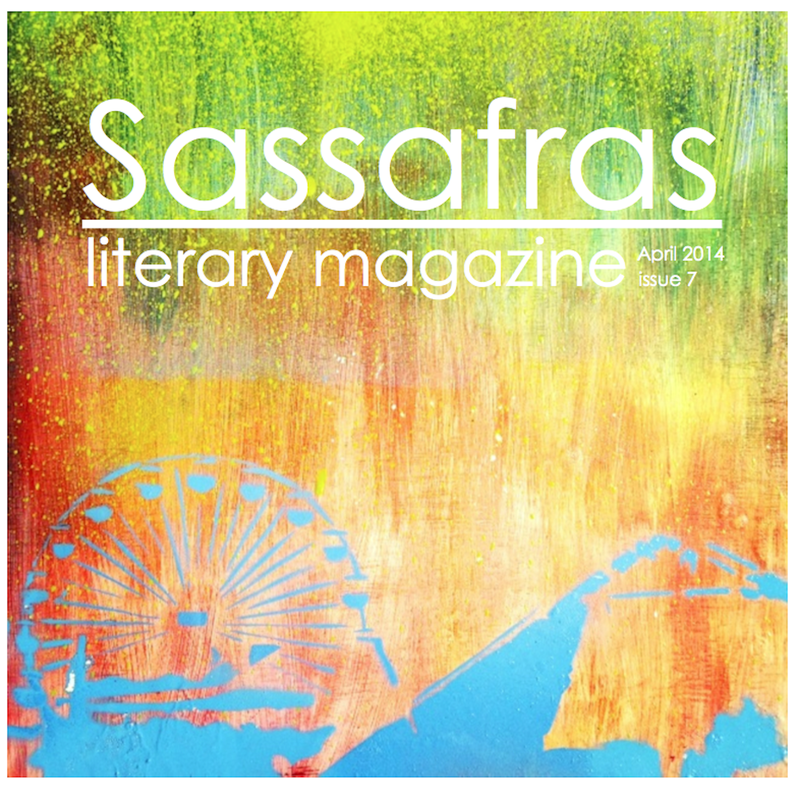 Sassafras issue 7 is here! Number 7 is a plump little beast, 80 pages*, making it (at least) a double issue. *Well, a large chunk of the 80 pages = white space and the non-compact font of choice, Deco Type Naskh. The issue 7 page will follow after this post.